Samples from the Hall molybdenum porphyry deposit, near Tonapah in Nevada, USA were collected both on site and from Prof. Steve Shaver's collection in 1990. The samples were analysed by baro-acoustic decrepitation to understand the decrepitation features of porphyry fluid systems so that decrepitation could be used as an exploration method for porphyry deposits. Both these deposits contained extensive quartz vein stockwork systems, and this quartz was the dominant material sampled. Additional samples from the nearby Mt Hope molybdenum prospect were collected in 1995. The locations of these deposits are shown on this map of Nevada. Geology, alteration, mineralization and trace element geochemistry of the Hall (Nevada moly) deposit, Nye county, Nevada. by S. A. Shaver, published in: Geology and Ore deposits of the Great Basin, Symposium proceedings, April 1990. Published by the Geological Society of Nevada, Reno, 1991. At the Hall molybdenum deposit, Nye County, Nevada, each of two molybdenum-bearing, quartz monzonite stocks was emplaced at 66-70 Ma (K-Ar and U-Pb) and underwent continuous inward crystallization which was interrupted three times by the successively deeper release of hydrothermal ﬂuids. The stocks are texturally concentrically zoned and each contains three stacked molybdenum orebodies and overlapping zones of alteration and mineralization. Regional geology, including eastward dipping (40-80°) Tertiary volcanic rocks, and paleomagnetic data indicate that the stocks and their altetation/mineralization zones have been tilted some 70’ about a N30W axis and now plunge west at about 20°. Mapping, petrogtaphic, and ﬂuid inclusion studies indicate that in each alteration/mineralization pulse, early quartz-molybdenite + chalcopyrite 1 pyrite veinlets with K-feldspar envelopes (T=470-750°C; wt. % NaCl eq. = 8-19%) were followed by muscovite ± quartz ± pyrite ± ﬂuorite (greisen) veinlets with envelopes ofcoarse-grained (1-23 mm) muscovite. Later fluids in some pulses formed quartz-magnetite veinlets or chlorite-enveloped (quartz-pyrite-chalcopyrite+magnetite) veins, but all pulses were ultimately closed by base-metal veins (quartz-galena-sphalerite-chalcopyrite ± tetrahedrite ± pyrite) having no alteration envelopes (T:370-450°C; wt. % NaCl eq. = 50-41%). Molybdenum orebodies are related to both abundance of, and molybdenite concentration in, quartz-molybdenite veinlets, with successively deeper orebodies, related to successively deeper phases of each stock, consistently lower in grade. Copper anomalies (200-1000 ppm) generally occur with high molybdenum concentrations (400-2000 ppm) as a result of the nearly ubiquitous occurrence of chalcopytite in the quartz-molybdenite veinlets. Fluorine anomalies (1000-21,000 ppm) are related to greisen veinlets and occur 30m to more than 100m outward of molybdenum anomalies. Tin anomalies are generally weak (5-25 ppm) and either coincide with high ﬂuorine concentrations (in one stock) or are sporadically distributed (in the other stock). Tungsten anomalies are also weak (5-18 ppm) and, although locally present with tin and ﬂuorine anomalies, are more typically sporadic in distribution. Lead (300-5000 ppm), zinc (200-4000 ppm), manganese (150-3200 ppm), and silver (3-30 ppm) anomalies are related to base-metal veins and occur 40-150 m outward of molybdenum highs. Arsenic is sporadically distributed in general, but correlates well with base-metal anomalies where copper anomalies are also present. Weak gold anomalies (10-25 ppb) occur with high base-metal concentrations, as do sporadic bismuth anomalies (2-18 ppm). Lithium (16- 56 ppm), thallium (0.9-1 .9 ppm), antimony (5-11 ppm), and niobium (S-9 ppm) anomalies are sporadic and do not correlate with other elements. Elemental dispersion patterns are interpreted to be overwhelmingly hypogene in nature, although remobilization of some elements during post-vein sericitic and argillic alterations may have occurred. Such late alterations are pervasive and post-ore, and are unrelated to discernable microfractures or veins. Preliminary isotopic data suggest both sericitic and argillic alterations formed from ﬂuids having signiﬁcant meteoric components, in contrast to magmatic—ﬂuid—dominated main—stage events. Each of the two now-tilted stocks at Hall was produced by a single injection of magma which crystallized progressively inward until internal magmatic and ﬂuid pressures were sufficiently high to fracture the crystallized stock carapace, “pressure quench” the magma to a limited depth beneath the carapace, and release accumulated hydrothermal ﬂuids which altered and mineralized both the carapace and pressure—quenched porphyry beneath. Pressure quenching and/or formation of crenulate quartz layers appear to have adequately sealed the magma at depth to permit repeated buildups of pressure and repeated releases of hydrothermal ﬂuids from the same magma body. Three pulses of ﬂuid release occurred via this mechanism in each of the two stocks at Hall to produce five temporally distinct molybdenum orebodies (generally 400 to > 1000 ppm Mo), and to produce distinct but overlapping zones of alteration and mineralization in each stock. Veinlets produced during these alteration and mineralization pulses were not emplaced as random stockworks, but rather in two dominant sets whose orientations may be radial and concentric, respectively, to the host stock phase. Because successively later pulses in each stock were associated with magma which was successively deeper in the magma column and therefore more completely crystallized at the time of ﬂuid release, the stocks display stacked orebodies and a concentric textural zonation. The oldest orebody in each stock in generally within and associated with the finest—grained, highest percentage groundmass, apical phase of each stock, and successively younger orebodies in each stock are related to (and within) phases which are successively deeper, coarser-grained, and poorer in groundmass. During each alteration and mineralization pulse, ﬂuids are interpreted to have been partly buffered along a K—feldspar/muscovite univariant curve, evolving during cooling toward higher K‘/H‘ ratios. Main—stage alteration thereby progressed in all pulses from albitic to potassic to greisen. These types of alteration appear to have taken place under largely lithostatic pressure conditions. Greisen alteration was followed in different pulses by various vein types whose characteristics suggest more nearly hydrostatic pressure conditions. All pulses in each stock appear to have been closed by base-metal veins (370—448°C). However, the second pulse produced late chlorite—enveloped veins and the final pulse in each stock appears to have also formed late quartz—mt veinlets. Base—metal veins account for distal Pb-Zn—Mn—Ag + As anomalies at the deposit. Albitic alteration in both stocks is ubiquitous, but weakly developed, and appears to be late magmatic in origin in rather than related to any hydrothermal veins. Potassic alteration, generally related to quartz—molybdenite (+ cp ± py) veinlets with secondary K-feldspar haloes, decreases in intensity with depth in each stock as a result of a decreasing density of quartz—molybdenite veinlets. Greisen veinlets and greisen alteration likewise decrease in intensity with depth. Quartz—molybdenite veinlets (and associated Cu and Mo anomalies) in each pulse are generally distributed in a cupola—shaped zone within and slightly above the associated intrusive phase. Greisen veinlets (musc + quartz, py, ﬂuorite) followed the quartz—molybdenite veinlets in each pulse. These produced ﬂuorine and, locally, tin anomalies and are distributed in a similarly—shaped cupolar zone which extends outward of and overlapping the zone of quartz-molybdenite veinlets. Differences in veinlet density (both greisen and quartz—molybdenite) between successive phases in each stock are too great to have resulted from overlapping of veinlets from different pulses and suggest that a gradient in volatile content was present in the magma column from which each stock crystallized. It is not clear from the work at Hall whether Climax-type deposits and quartz monzonite type deposits evolved from similar parent magmas, but many of the differences in petrology, alteration, and mineralization are consistent with shallower depths of emplacement for the Climax-type deposits (0.6 — 3.1 km) and deeper emplacement for the quartz monzonitic deposits (>4—3 km). 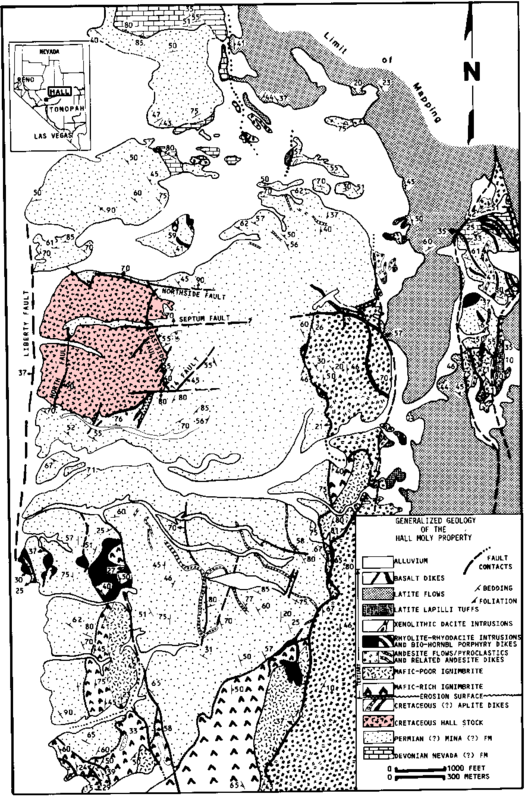 The Mt Hope deposit was merely an exploration prospect with very few drillholes at the time of sampling and there was almost no geological control for the samples which were collected during an organized geological group tour. This area is now being developed as a mine and some geological information is here. 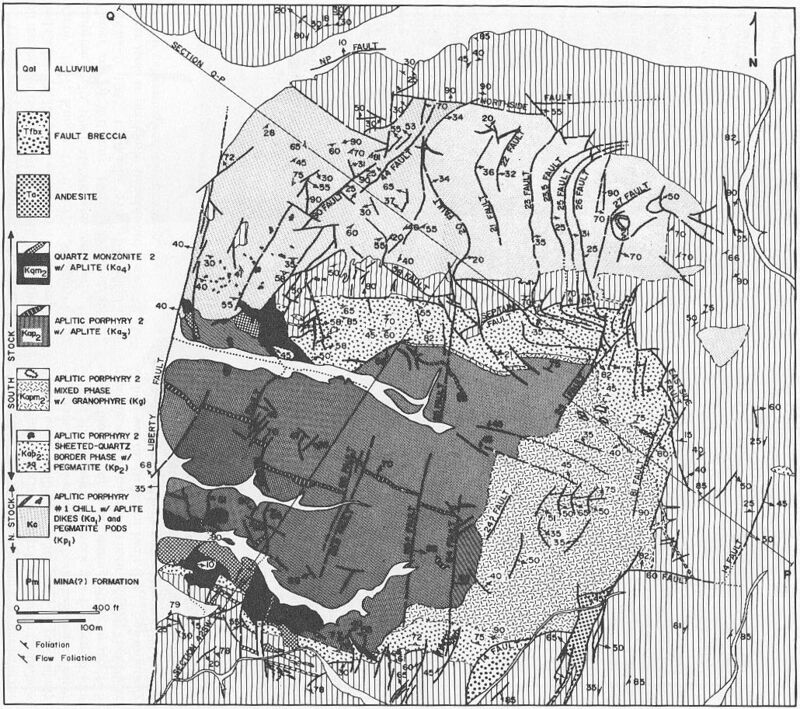 This map of the regional geology near the Hall deposit is by S. Shaver and is from his publication listed above. And this is a detailed map of the Hall stock, also by S. Shaver from the same publication. S. Shaver identified many different phases within the stocks which he labeled with codes like Kqm2 etc. Where known, these phase codes are also used on my samples to try and relate fluid inclusion populations to the mapped crystallization and hydrothermal fluid stages. 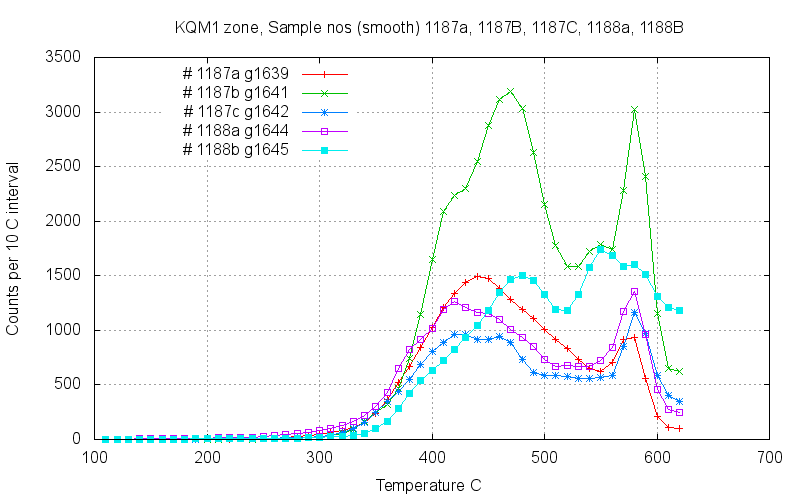 The decrepitation results show quite complex curves caused by the presence of multiple fluid inclusion populations in all these samples. 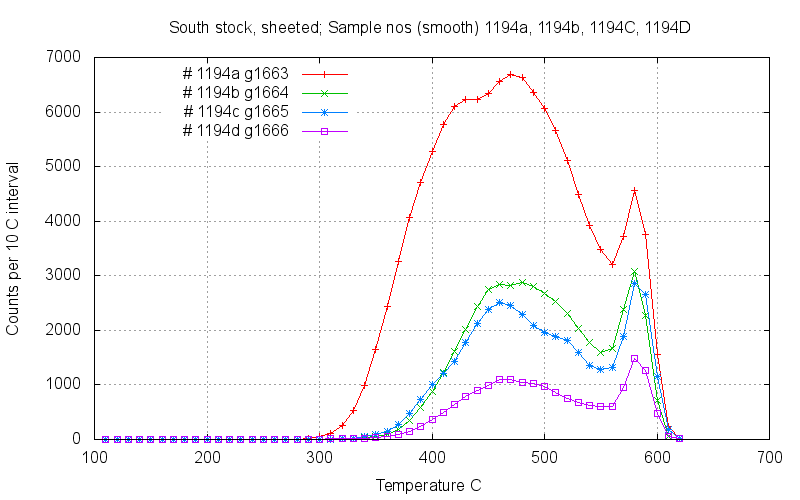 Many samples show decrepitation peaks near 400 C, 430 C and/of 480 C and these variations could be useful in identifying the locations of mineralization. A few results from the Mt Hope Mo prospect, near Eureka Nv., showed similar decrepitation patterns (plotted here) and this suggests that Mt Hope also contains Mo mineralisation. 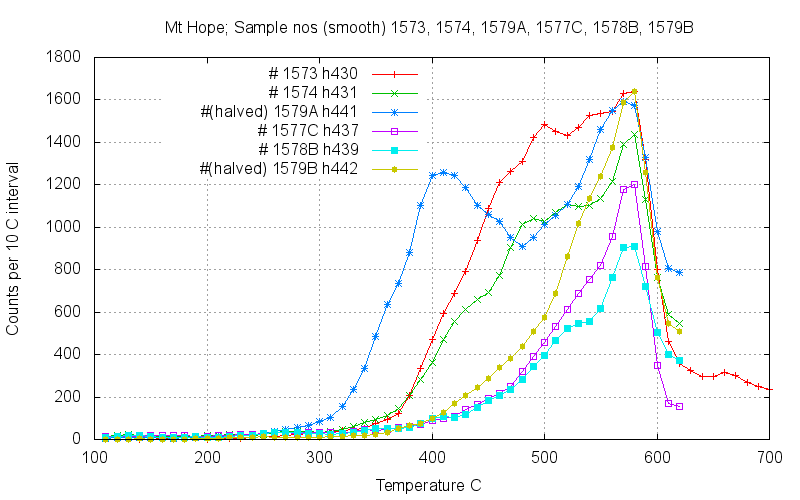 Seven samples were selected for detailed interpretation using curve de-convoultion. 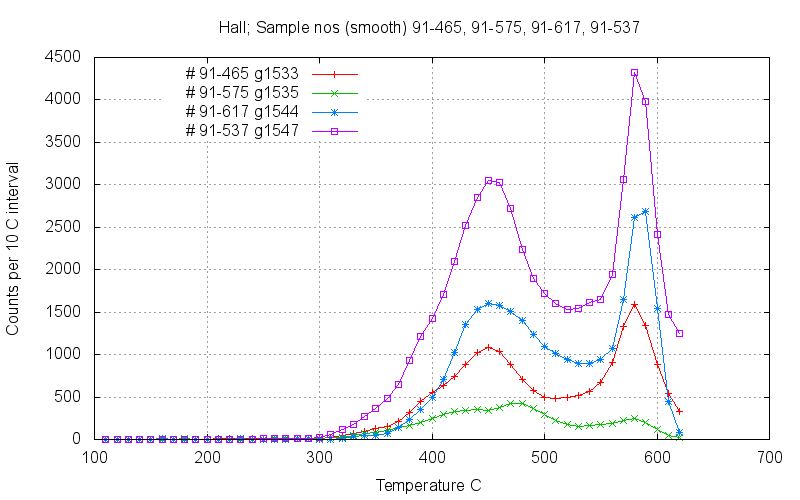 (discussion here) These samples from the Hall deposit show quite complex combinations of fluid inclusion populations, often with 5 components required to give a good fit to the data. 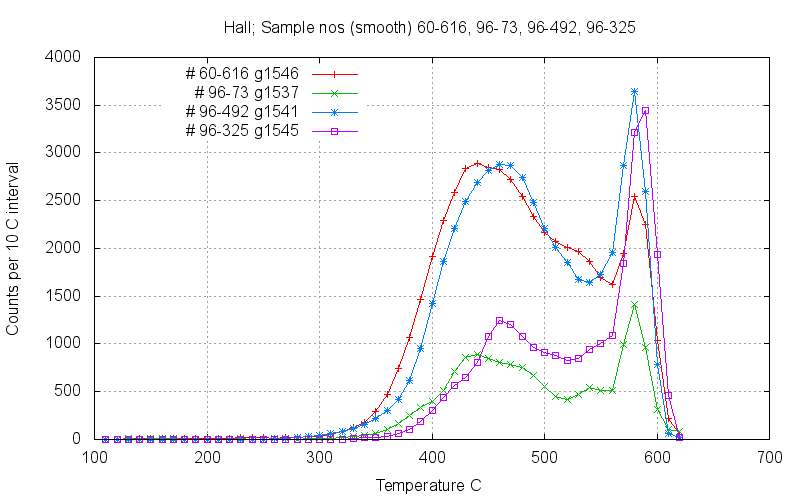 Most samples show a component with a temperature mode near 450 C as well as about 540 C. Note that the peak at 580 to 590 C is related to the alpha - beta quartz transition and is not used in interpretation (explanation here). A significant number of samples also have a distinct component with a low mode temperature near or below 400 C. This separate low temperature component can be used to classify the quartz into at least 2 major types. Only sample 1188A had visible molybdenite, which was abundant, but most if not all of these samples are from potentially molybdenum bearing phases according to Shaver's classification scheme. This plot summarises the individual fit results showing the mode temperature of each component, with the size of the peak (logarithmic area) represented by the circle diameter at each plotted point. 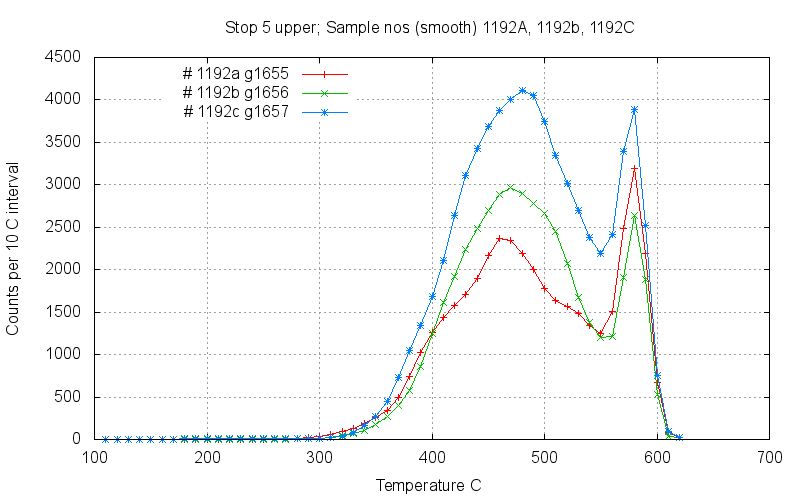 Note the presence of 350-400 C peaks on the 4 leftmost samples, and the lack of this temperature on the rightmost samples. This limited study of only 7 samples, together with the lack of location information for some samples makes it impossible to actually determine what decrepitation features might be used to directly pinpoint mineralized quartz veins. However, the great variations observed do suggest that fluid inclusion decrepitation data within porphyry systems has the potential to identify and outline features of importance which could facilitate exploration. Most samples were collected during an organized geology tour of the mine in 1990. Samples with the same number but different letter suffixes are multiple subsamples collected from a single location but within a radius of a few metres. 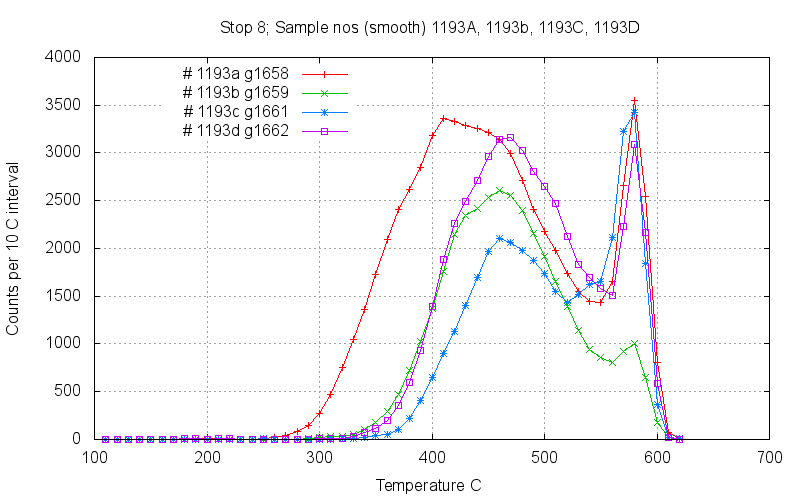 17 of the 18 samples in these first 5 graphs are from S. Shaver's collection and sample locations and details are unknown. 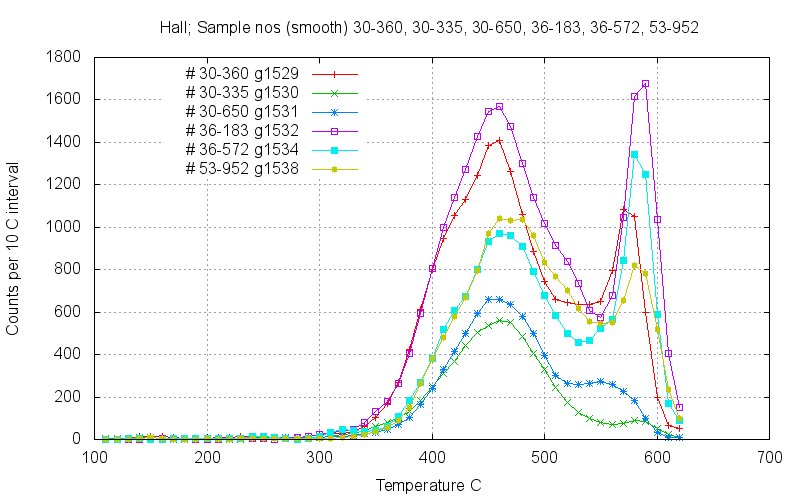 None of the samples show low temperature decrepitation below 350C, which indicates that the fluids lack any CO2. However, there are a range of peak temperatures between 350 C and 500 C which indicate substantial variations in the fluid temperatures during quartz formation. These variations may be useful as a diagnostic to identify different stages of the mineralising processes. 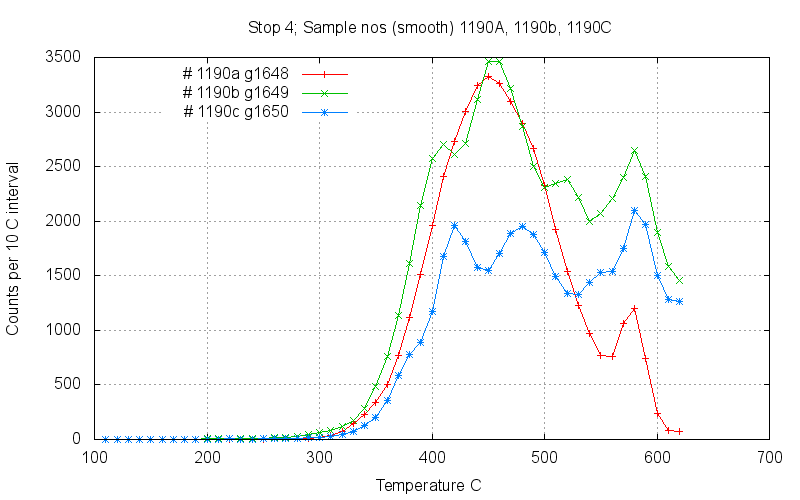 But without geological and location information on these samples, the significance of these temperature variations cannot be interpreted. 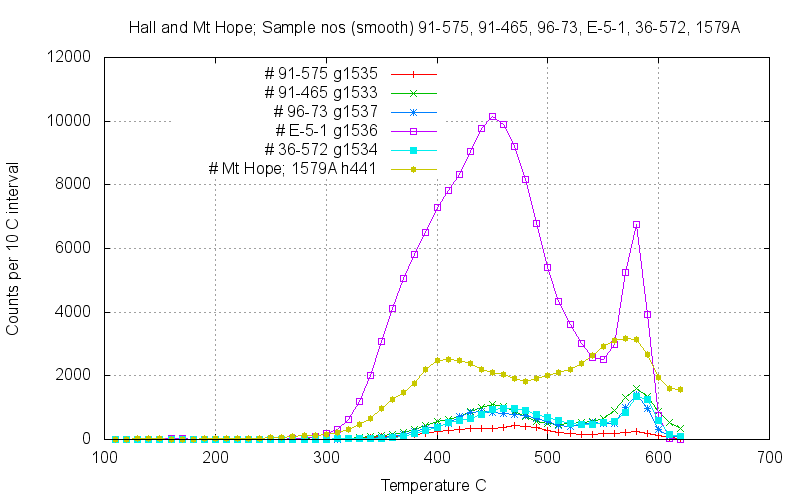 Note the distortion of the peaks near 400 C, particularly on samples 36-183 and 30-360 (magenta and red) due to a subordinate decrepitation peak near 400 which affects the shape of the main peak at 450 C.
Sample E-5-1 (magenta) has a pronounced subordinate peak near 380 C, while The comparison sample from the Mt Hope prospect (1579A, yellow) shows a distinct 400 C peak instead of a peak at 450 C.
Samples in the following graphs were collected on an organized group tour. Sample details are here. 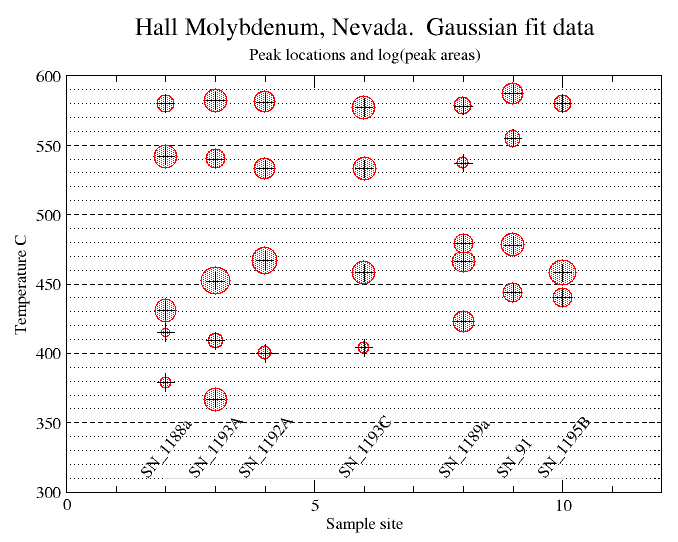 In the following graphs the subsamples (with the same number, but different alphabetic suffixes) from each location are plotted together which shows the amount of local small-scale variation in the samples. 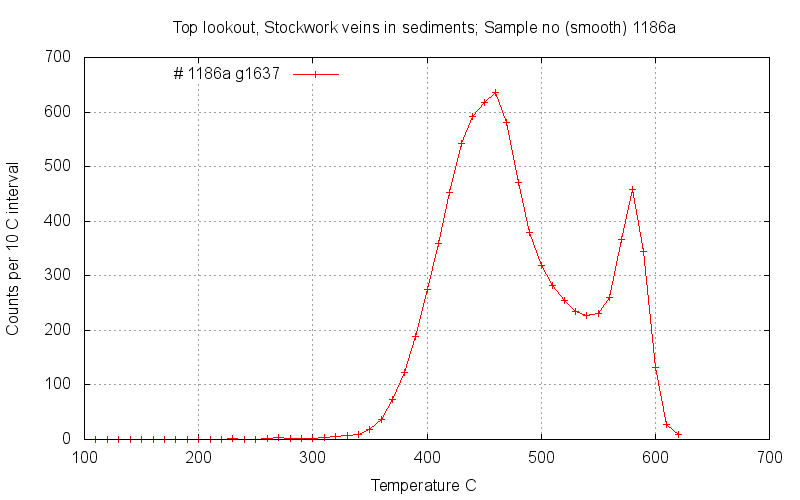 Sample 1186A is of quartz hosted in sediments outside but near to the Hall stock and lacks the lower temperature (400C) decrepitation peak. The mineralized quartz within the Hall stock shows complex decrepitation, frequently with a decrepitation peak just below 400 C as well as the common peak near 450C. 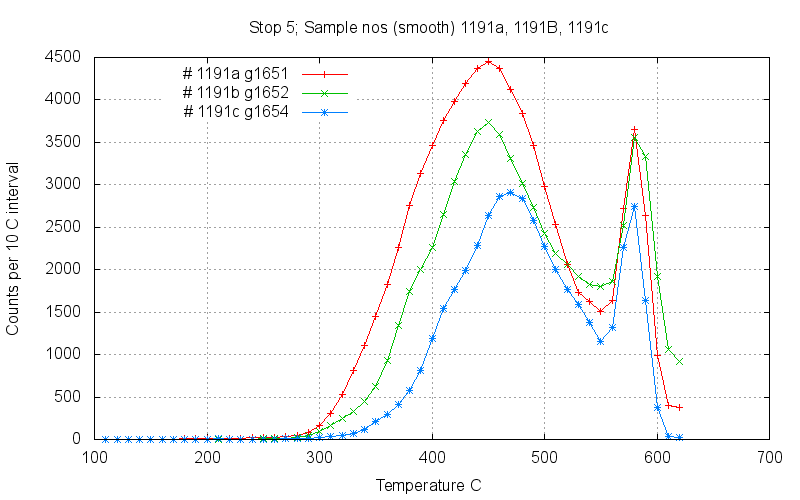 And in some samples decrepitation peaks around 550 C also occur, such as sample 1188B (cyan). 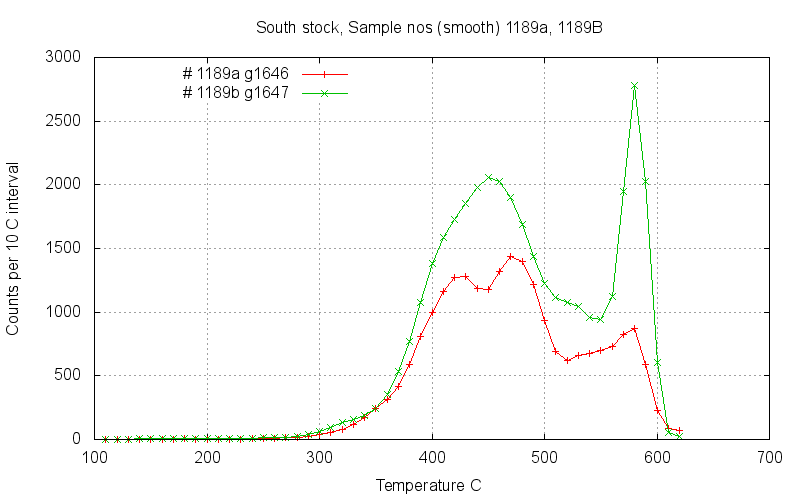 Note that these two samples 1187 and 1188 are from the same location. These samples are from the Mt Hope prospect, for comparison. 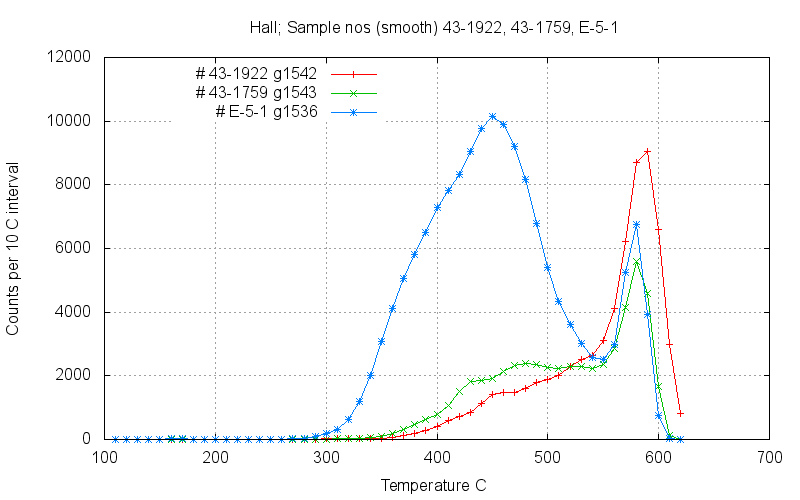 Most samples (not shown) lacked the 400 C and 450 C peaks commonly seen in the Hall samples, but samples 1579A (blue), 1573 (red) and 1574 (green) do have decrepitation peaks at 400 C and 450 C as seen in the Hall samples. This similarity suggests the Mt Hope could host molybdenum mineralization.